The first is the Giant’s aria. It was recorded at the time of the fugato, and requires a flash animation as an example of what is to be projected to describe the story the Giant is telling. It now has a potential animator who is working on it. The second is Sakon’s Arietta, which will probably be the first of the three to be shown. The third is Pamela’s Arietta. I wrote this snippet from Act III especially for the demo, and it was recorded this week. If you mean whether it will use sets and costumes, I intend it to, and as close to the original as possible without compromising the work. I intend to sober up on the colours a bit to give it less of a “costume” vibe, but retain the looks to keep it surreal. Here is the first Questions and Answers post. I will occasionally answer some questions that are floating around on the internet about this project, if I can, or if I deem it good to reveal at this point. Greg Liberko, CrimsonLoftwing and others: Why is Captain Viscen a girl? It is not uncommon in opera to have women interpret male roles, especially those of young men. I will do it more than once in this opera, for it serves mainly to give the music some timbral variety when there is more than one character singing, and to help understand the text, as it is already difficult to understand an opera’s libretto on its own. Booklets with the libretto (lyrics) for viewers are not an idea to set aside. HiperPiece: Did you made the music cover for this as well? And could you please put a link to listen/download it? If by music cover you mean the entirety of the track, then yes. The way I work with Mr. Kondo‘s and Mr. Minegishi‘s brilliant themes in the opera usually follows this pattern: I show the theme as close to the original instrumentation as possible; then, if appropriate, lyrics are sung to it; finally, I start playing with it, developing on it in whatever fashion most suits the context in which it appears, from basic ornamentation to stuff you would have to be looking at the score to figure out how they are related to the theme, so there ends up being plenty of new music besides the original themes. These rules aren’t set in stone, obviously, as it would become too predictable a system if it were so. Some themes get more development than others, others get a different version shown before the original, some are fit into their context so specifically that there is barely any room left for development. DrakeWolfKnight, Kate Clarke, and others: I’m a singer/musician/dancing penguin and I would love to be a part in this! Do you need any help? Help is never refused. Right now, however, I am focusing on the production of the demos, and unless something changes, we would rather have it so that the specific sound of the room and the microphones used to record the voices remained the same, which would not be the case in setting up overseas recordings and attempting to mix the results. We are managing with what we have, and it serves the purpose so far. In what concerns help in the actual staging of the work, that would have to wait until after there are enough demos (I plan 8 more) and enough fan support to communicate with Nintendo without looking like some mini-schmuck from Portugal waving his arms around at the company’s colossus about what he intends to build. The way this project can become a reality depends on Nintendo’s verdict, and it can go in many ways. I will, however, do my part in everything I can, and will undoubtedly finish writing the opera regardless of the outcome (I am aiming for finishing the 3rd act in September). Shaun Wrx-Sti Dettman: So it’s centered around Kafei and his love and not Link? As I have said in this post, Link is absent from the opera. It is explained in more detail in the linked post why that is. Kafei provides the perfect character to focus on in an operatic setting. He is the center of the action as he represents the only character left with enough strength to fight for his promise while others, like Darmani, have perished, or others still are just lost in the general decaying sense of trust of Termina. SmashQueen: What spurs Kafei to act earlier? In my little modification, Kafei doesn’t know that Sakon visits the Curiosity Shop. So, after frantically searching through Clock Town, he concludes he must be out of town somewhere. He begins the opera desperately searching for any criminal activity from outside town. If you remember the juggling brothers in West Clock Town, they talk of the kidnapping in the swamps to the south. That’s Kafei’s first lead in his frantic search for the mask. He’ll follow lead after lead until landing on the right one. But don’t think I’ll have Kafei do Link’s deeds. He is not a hero, so he will be subject to the hostile environments as a regular Terminan would. As you can see in my YouTube channel, there’s an instrumental called Odolwa and the Deku, so something in Kafei’s meddling in the swamp leads the Deku to actually run into Odolwa. Some parts of the world will be more explored than others. I can’t do miracles and I don’t want to stretch suspension of disbelief, so some places will simply not appear, or else it will become rather ridiculous to have Kafei become a professional explorer like Link. That’s all for now. If you have any more questions, feel free to ask them here or on Facebook. What is a Majora’s Mask Opera? Imagine there are only three days left to live, as the moon is on a course of collision with the world. Imagine there is a young man who, among all the people who either ignore the incoming doom, refuse to believe it or are sadly resigned to it, has promised to marry the love of his life. Imagine his unique symbol of their union, like our wedding rings, is gone, stolen. Imagine he is determined to get it back and get married, regardless of the world’s fate. I find the dark ambient of this game and the moving plot of these two characters as beacons of hope and trust amidst all the fray to be very engaging, and very fitting of an opera. Developing on the beautiful themes composed by Koji Kondo and Toru Minegishi, I have started writing it last year, and I will keep you updated on my progress on this blog with previews, demos, thoughts and answers to questions you might want to pose (and that I might be able to answer). In fact, expect a first Q&A post soon! On the 28th of November 2011, after a long period of planning, and with the 25th anniversary of Zelda in mind, I started composing and writing an opera of The Legend of Zelda: Majora’s Mask. Now as I’ve said in the first forums I posted about this, I have avoided reducing this to medley form. I develop on every relevant theme, taking them as bases to be grown on and to make a complete and organic work, instead of a patched-up musical track. I have my original work as examples of what I can do, and I am usually not one to make these kinds of adapted projects, but Zelda is something that has always fascinated me, and Majora’s Mask is the one that always dug deepest. That reconstruction does not change the story’s core concepts at all, but it alters something quite important for those who take refuge on the heroic deed of a single individual (Link). The reason a game like Zelda can’t be adapted to stage at 100% in every single aspect is because a game is built as an interactive medium. A game like Zelda lives on diversity and exploration. I chose Majora’s Mask for a reason: In all of its diversity, Majora’s Mask has the ability to captivate through the personal anguishes of the inhabitants of a dying world. Now, turning it into a never-ending list of equally important woes would be static and unimportant, and here is the key issue: So would turning a mute heroic character into a chore-handler for a world with living, thinking and feeling individuals. 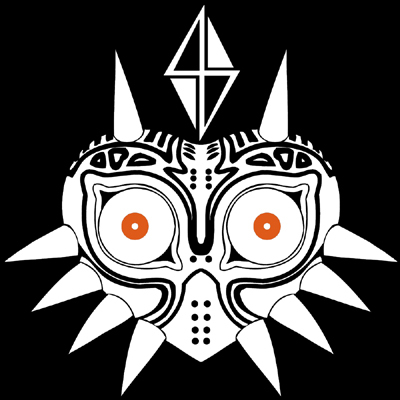 It is a what-if cautionary tale to the world of the audience (like Ikana was to the rest of Termina) telling of Termina’s fate without the intervention of a savior, a Deux Ex Machina in Hylian form. The core concepts remain the same, as I’ve said. The story revolves around promises, the whole world’s mechanic and sense is exactly the same. By centering the story on Kafei and Anju, I can make it that Kafei’s quest for the retrieval of the Sun Mask and the fulfillment of his promise comes out of his own accord, his own effort, and provide a fluid narrative of his tracking of Sakon and his treasure. The struggle of a last promise in a world fated to be destroyed. Don’t think Skull Kid and the mask Salesman will be undermined, on the contrary, I expect the Salesman to be a very important guide to the events in Termina and cross paths with Kafei later on, as he is the one responsible for taking the mask to avoid disaster and then having Skull Kid steal it from him. As I said above, a game is a game, and a game’s diversity is made for interaction. In an opera, that diversity becomes harmful. It becomes dispersion. My aim is to make a big, serious and most of all effective work out of Majora’s Mask, and you can take my word on the respect I have for canon. So much that instead of modifying or harmfully cutting Link’s diverse actions to adapt the work, I would rather make it keep its sense simply by letting Termina exist nearly unchanged. Although you could say that this fits into the newly-revealed timeline, in which there are two branches where Link does not go to Termina (I didn’t know that when I started this), I understand and humbly accept all the flaming that might erupt from the anti-official-timeline-canon-centered community. However, I am sure of my abilities to make a bittersweet cautionary tale out of Majora’s Mask for our own world to see. Zelda fans or not. And if it wishes, to compare to our own dangerously decreasing sense of trust and faith in people. Having said this, I am sorry for the long post, but I feel this clarification is necessary for those who weren’t already aware of it. The opera will be divided into 3 acts, one for each day, and they will obviously not obey to the “one set per act” common rule. It’s the 21st century, we can perfectly well loosen up some things without ditching professionalism. I have taken that into account as I write. In case you haven’t clicked the link at the top of the post, I leave you with the first demo (details in the description on YouTube). You can find instrumentals from the opera in my channel as well. Give me some time, people, and this will be fully operational with a decent post on.